Euro is still consolidating. Earlier the price rebounded from the upper levels and right now, the main target is at the local correctional level of 38.2%. If the price breaks it, the market will continue falling down. At the H1 chart, the bears were supported by the level of 61.8% and the pair rebounded from it. According to the analysis of the temporary fibo-zones, the predicted levels may be reached by Wednesday. Later, I’m planning to move the stop on my short position into the black. Franc is moving inside flat pattern. The target is still at the correctional level of 38.2%. If later the pair breaks it, the bulls will start a deeper pullback. 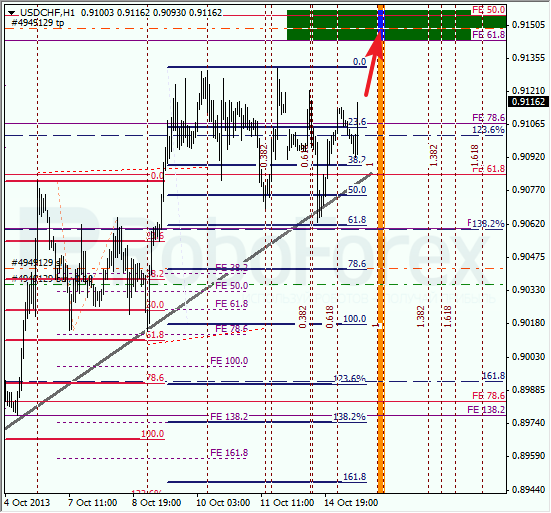 At the H1 chart, the pair rebounded from the trend line and the level of 61.8%. The price is just several tens of pips away from its upper target. According to the analysis of the temporary fibo-zones, the predicted levels may be reached during the day.